Build a rain garden in your yard to catch the water running off your driveway, sidewalks, street and lawn to filter out pollutants. 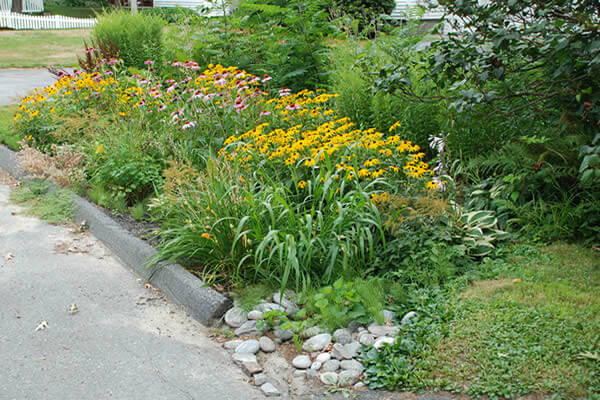 If you tend to have a lot of water that collects in your yard or roadway during a rain storm, you may want to consider redirecting it toward a rain garden rather than letting it flow down a storm drain. A rain garden is a depressed area in the landscape, planted with grasses and flowering perennials, that collects rainwater from parking areas, driveways, walkways and roofs. This rainwater runoff can be polluted with bacteria, chemicals and heavy metals. During rainstorms, runoff enters the rain garden and slowly filters into the ground. The runoff is filtered and cleaned naturally by soil and plants, and reduces the amount of polluted runoff entering our waterways, keeping our environment healthier! When rainwater filters slowly into the soil, rather than “running” off pavement, it also allows more water to recharge our underground water supplies. Ideally a rain garden would be about 6 inches deep and 10-15% of the size of the paved or roof area that drains into it, but they can be deeper, shallower, larger or smaller to suit your site and your tastes. and can be filled with more formal plantings or designed for minimal maintenance. Click here for an introductory guide on how to site, design, plant and maintain a rain garden. 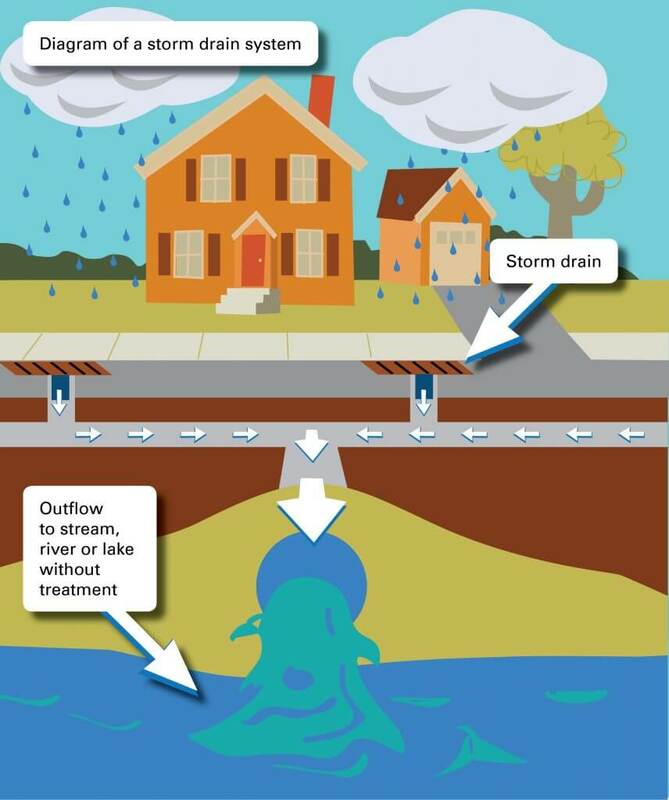 When rainwater from the street flows directly into storm drains, it carries the pollutants that are on the road into our waterways – untreated. (Pollutants include motor oil, gasoline, fertilizer, pesticides, dog waste, etc.) This dirty runoff can cause water pollution in our local streams and ponds. 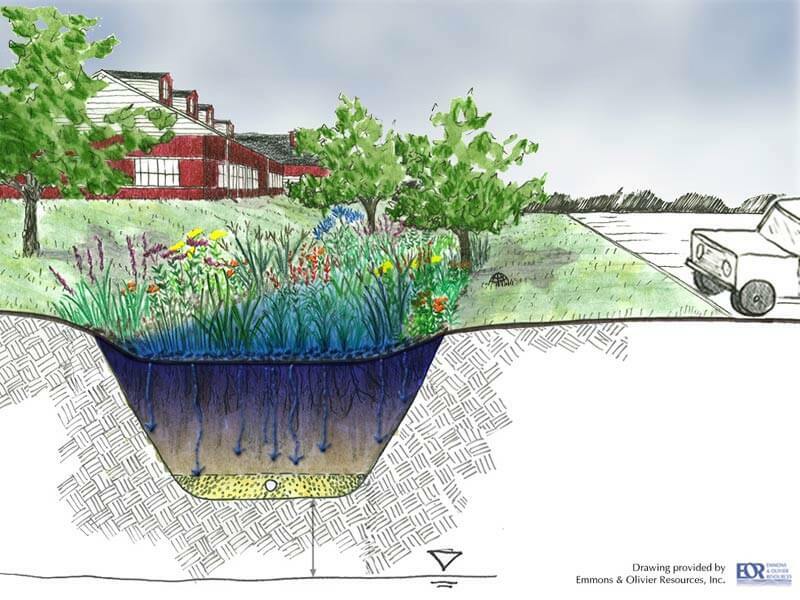 Rain gardens are a great way to intercept and filter that polluted water! For more information, contact NepRWA Environmental Scientist, Chris Hirsch at hirsch@neponset.org or 781-575-0354 x302. Two New Rain Gardens in the 'Shed!